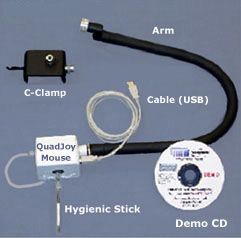 QuadJoy a mouth operated joystick. 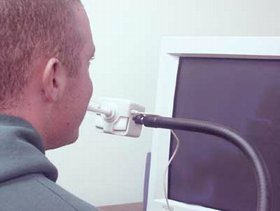 The joystick is controlled with your mouth or chin. The farther you move the joystick, the faster the cursor moves. Mouse button activation can be made with the built in sip and puff switch, a switch with the external switch jack or manually with the actual mouse buttons for able body assistants. Switch users can use Quadjoy with External Switch Jack for mouse button activation. 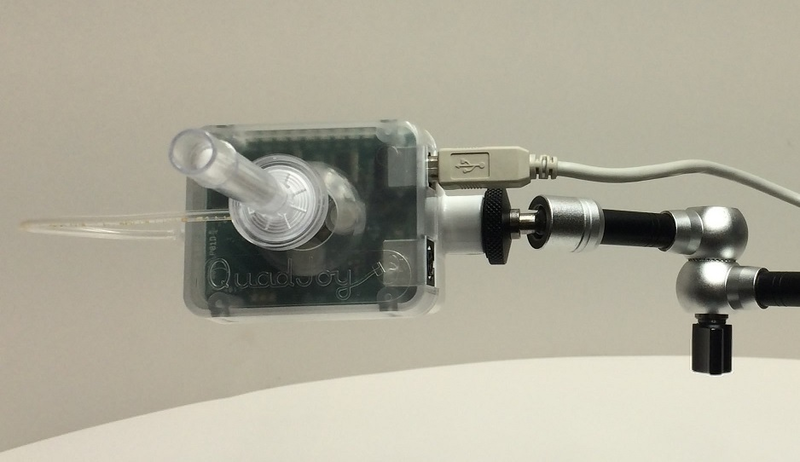 QuadJoy can be mounted to most flat surfaces and is assembled to mount on the right hand side of the user. Flexible Mounting Arm & Clamp included. Dual Mounting Studs on a 2 1/2" C-clamp makes horizontal or vertical mounting a breeze.